It's not uncommon for many die-hard football fans to get a little out of hand. This can be especially true as the quality of play increases. The University of Wisconsin in Madison is typically considered a major football program and, as such, its teammates are high-profile figures on the school's campus. Robert Wilks and Wendell Venerable were found guilty of substantial battery after reportedly attacking Montee Ball, the starting running back at the University of Wisconsin, according to the Wisconsin State Journal. The attack happened on August 1 as Ball was walking home from a night out with friends on campus. Although the attack on Ball may have been related to another incident from July between Ball and the defendants, there was no official link, according to local police officers. The two defendants were given the first offenders placement, which is a program that requires the two to meet certain stipulations under a contract and meet with professionals. If they are unable to do this, they'll be brought back to Judge St. John and be sentenced, which can be up to 3-and-a-half years for substantial battery. "This gives you an opportunity to get the support and services you need to avoid coming back into the criminal justice system," Judge St. John told the defendants. With cases that often involve only a few individuals, it may be hard for prosecutors to produce third-party or objective evidence of the crime. 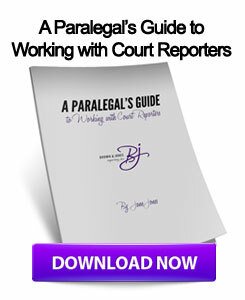 In such a situation, it could be best for litigators to partner with realtime court reporters that can provide accurate deposition transcripts and even video deposition services that will allow lawyers the ability to piece together the events. This entry was posted on Monday, December 24th, 2012 at 9:55 am	and is filed under All Posts, Wisconsin Legal. You can follow any responses to this entry through the RSS 2.0 feed. You can skip to the end and leave a response. Pinging is currently not allowed.